This hiking guide to the San Juan Mountains is based on two concepts, GPS navigation and collaborative sharing of information among hikers. GPS tracks from interesting hikes or cross-country skiing trips are available on this website for free downloading to your GPS software and transfer to a GPS receiver. Following a track that has already been established by someone while hiking in an area eliminates the need for maps, compass, and trail descriptions. It also makes outings safer by reducing the risk of getting lost. Contributors may remain anonymous or get credited for contributing GPS tracks as well as images and information. Credits can include links to other sites. GPS hiking is most beneficial to explorers who enjoy wandering off the highly traveled trails in search of new scenery and solitude. Hikers staying on established trails will not benefit from GPS navigation, except where side excursions can lead to new vistas, landscape features, or historical sites. GPS devices are already ubiquitous, getting less expensive, and also appear in smart phones and iPads. This means that the infrastructure for this guide is already in place. Suggestions for applicable software can be found under references. The virtually unlimited storage available on the Internet for electronic documents permits the posting of many pictures and descriptions of history, flora, and fauna pertaining to particular hikes. And unlike hardcopy guidebooks, this guide is easily edited and upgraded as new information becomes available. Since it’s very easy to navigate back to a recorded track with the help of a GPS receiver, the method lends itself to cross-country hiking in the high country without concerns about hikers getting cliffed out or lost. In general, GPS guidance also improves safety for hikers who inadvertently stray from an established trail, or for skiers who find their tracks unexpectedly obliterated by wind or new snow. The “business model” for this endeavor is based on collaborative sharing of information and on the powerful features provided by the Internet. Perhaps the most prominent of the collaborative web-based projects are Mozilla’s Thunderbird and Firefox, and Wikipedia. Contributors donate their expertise and efforts to a venture that reaches beyond the collaborators and benefits a larger community. It is hoped that this project can thrive and become more comprehensive as a result of generous contributions. 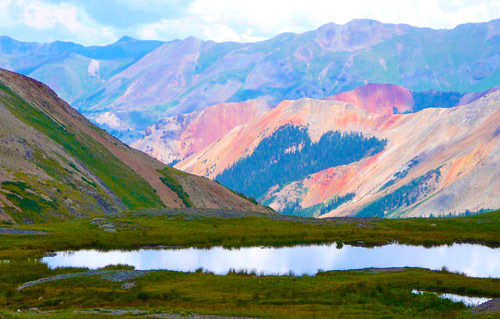 The credit for expertly researching most of the trails listed in this guide goes to local hiking enthusiast Kelvin Kent, who spent several decades exploring the spectacular scenery around Ouray. His guidebooks contain a wealth of information and detailed descriptions of trails as well as directions to the trailheads.